Because of their tender age, disabled children need so much more than special medical care. That’s where the Family Health Support Program, a collaboration between UMMC and the Massachusetts Department of Mental Retardation, comes in. Staffed by two family health supporters who are personally experienced with the challenges of disability, the program provides resources, referrals and, just as often, an ear to listen and a shoulder to lean on. While similar programs have been developed by parents in the past, “Ours is the first to integrate parents of disabled children and disabled ‘self-advocates’ into the medical team,” says Martin Young, PhD, associate professor of pediatrics and program co-director. The program was launched a year ago with a pilot in the division of pediatric neurology. Beth Rosen, MD, assistant professor of pediatrics and neurology, is the program’s lead physician. After completing a medical exam, she introduces one of the family health supporters to the child and parents. The health supporter speaks with the family to make sure all their questions regarding the medical visit and prescribed medical care are answered; she further asks if they need help with other concerns, such as special education, respite care, special equipment and therapies. “We address anything and everything. 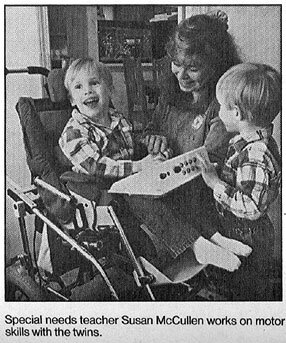 And if we don’t have the answers, we know where to get them,” says Family Health Supporter Cynthia Bissell, the mother of twins with special needs. She and fellow Family Health Supporter Sandra Milyko have found that support groups and community support are critical components. Milyko, who has cerebral palsy, also specializes in counseling families on self-advocacy. “Self-advocates are people learning to stand up for themselves in getting basic things – from jobs to health insurance to personal support – that most people take for granted,” she explains. GRAFTON – The doctors said Aaron Bissell would never talk. Aaron Bissell had a second opinion. With a dip of his chin, the 3-year old covers his tracheostomy, forces air past his vocal cords, and describes the merits of his latest toy car. Or asks to watch the “Jungle Book” video again. Or screams with delight as he executes a dramatic swan dive from the couch. His mother, Cynthia Bissell, remains calm. “He’s fine; he does that all the time,” she says. But as this couple will tell you, life isn’t about perfection, even when it appears to be. 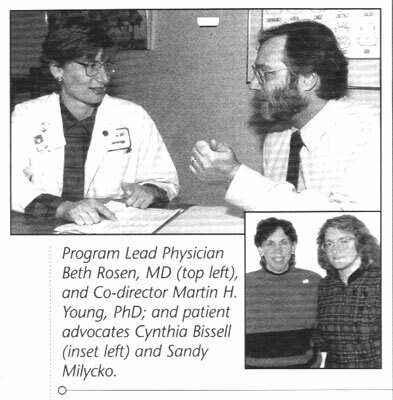 Rich and Cindy Bissell fell in love while working as nurses at Newton-Wellesley Hospital in late 1991. The couple rode their motorcycles together. They liked to work out together and go on long runs through the hills. They were engaged in February 1992 and married in Bermuda that July. By the summer of 1993, the Bissells were expecting twins. But only 23 weeks into pregnancy, Cindy went into labor. At Memorial Hospital, Cindy was given magnesium sulfate to halt her labor. Three critical weeks passed, pushing the twins a little further across the threshold of viability. But Cindy developed chorioamneitis, a streptococcal infection that posed a grave risk to her unborn children. Doctors decided to induce labor. Eric and Aaron Bissell were born in Memorial Hospital’s neonatal intensive care unit on July 28, 1993, more than three months early. Each weighed 2 pounds. Both suffered from abnormally low blood pressure, respiratory distress, bleeding in and around the brain, jaundice, and anemia. Slightly more than 10 percent of the 3.8 million babies born in the U.S. each year are considered premature, which is defined as being born at or before 37 weeks of gestation. Better drugs, advanced respirators, improved surgical techniques, and growing experience allow doctors today to save many Premature babies, even some as small as one pound. Whether an infant will have physical and mental handicaps depends primarily upon the degree of prematurity and secondarily upon its weight, according to Dr. Doug Derleth, a neonatologist at The Mayo Clinic in Rochester, Minn.
Those born after 30 weeks gestation generally survive and thrive with few if any long-term medical problems. Of those born before 25 weeks, more than half that survive have some degree of handicap, often severe. For preemies born in the 25 to 30 week range, survival and birth outcomes have been steadily improving. For Aaron and Eric Bissell, born at 26 weeks, life came with problems. The need for a breathing tube left Aaron with damage to his trachea and windpipe. Because scar tissue blocked much of his airway, doctors gave him a tracheostomy. He also had bronchopulmonary dysplasia, a chronic condition that affects his breathing. He came home still dependent on oxygen and needing 24-hour nursing care. Eric’s problems were even more serious. Tissue around his brain ventricles had been damaged due to insufficient blood flow and lack of oxygen, a condition known as bilateral periventricular leukomalasia (PVL). 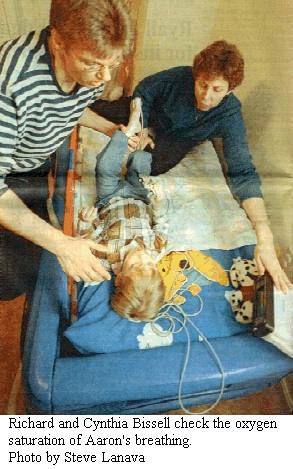 In September 1993, doctors told the Bissells that Eric had spastic quadriplegic cerebral palsy. He will most likely never develop the motor skills his brother has. It is still unclear how much mental retardation if any, was caused by the brain damage. There were no easy answers, just two small boys who desperately needed the best their parents could give. The Bissells traded in their red Jeep for a van equipped for the handicapped. Leisurely runs through the hills gave way to a blur of medical appointments, insurance forms and phone calls. Eric proved to be a fussy, colicky baby who had difficulty sleeping, so Rich and Cindy took turns pacing the floor with him throughout the night. Aaron has been hospitalized twice for pneumonia and must undergo a bronchoscopy under general anesthesia every six months. Both boys have had surgery for crossed eyes. For Rich and Cindy, the emotional strain was almost too much. Rich began seeing a therapist. The couple went through long, periods when they hardly spoke to one another. But Aaron and Eric kept them going. Slowly, the boys gained strength and weight. The traumatic memories of what might have been gave way to the reality of children who, for all their problems, smiled, ate, laughed and talked. The Bissells prowled the Internet for advice, support and information. Some of what they found was simple. A California father, for example, mentioned that his state pays for the cost of diapers. Rich discovered that Massachusetts does too – but you have to ask. Then there was the exotic. The Bissells learned about conductive education, which is beginning to receive attention in Canada and the United States. Developed by Hungarian Andros Peto, it is an intense therapeutic program that attempts to build new neural pathways in the brain through repetitive motion. They hope to have Eric attend a four-week session this summer. The Bissell’s persuaded their insurance company, Pilgrim Health Care, to bring Memorial Hospital under their insurance blanket. 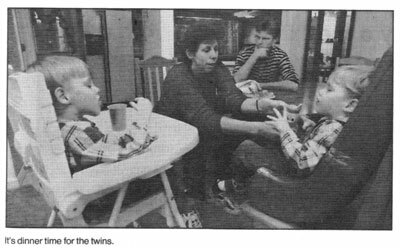 Through the Department of Public Health, they enrolled the twins in an early intervention program in Milford. Cindy ran across a doctoral thesis by a Cincinnati doctor who pioneered surgery to reconstruct the trachea. She contacted the doctor, who recommended a physician in Boston as a good choice for the difficult and delicate operation that should allow Aaron to speak without a tracheostomy. The Bissells became a part of a support network that saved them from despair. They made friends with couples they met online. Cindy set up a home page on the Internet that helps parents care for a child with a tracheostomy. She and Rich wrote an article for Exceptional Parent magazine, offering hope and perspective to other parents. 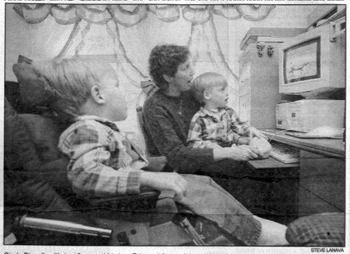 They began publishing a monthly newsletter to update family and friends on the boys’ medical and social progress. Cindy Bissell, with her 3-year-old twins, Eric and Aaron, has set up a home page on the internet that helps parents care for a child with a tracheotomy. Cindy has also begun working; part time at University of Massachusetts Hospital in Worcester as a family health supporter. The experimental program helps families connect with the services they need and educates doctors about the needs of families. The twins have been busy, too. On Wednesdays, Eric swaps his wheelchair for a horse. 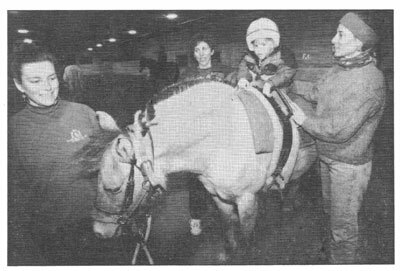 Through the therapeutic horseback riding program at Holden’s White Oak Farm, he is learning to better control his body and improve his coordination. Riding “Duchess” is easily Eric’s favorite part of the week, said his mother. As he watches Eric ride a horse or wrestles playfully with Aaron, Rich has begun to accept that, however different his children’s lives may be from what he imagined, each is a precious gift. Aaron and Eric are enrolled in the pre-kindergarten program at South Grafton Elementary School. They have made many friends. At the mall recently, Aaron and Eric were doing a very normal 3 year-old thing — acting up. Cindy declared she would buy the socks if Rich would walk the boys out of the store. As she waited in line, Cindy noticed the attention her family drew as Rich pushed Eric in his wheelchair and Aaron walked alongside. Some shoppers paused to stare. Others averted their eyes. 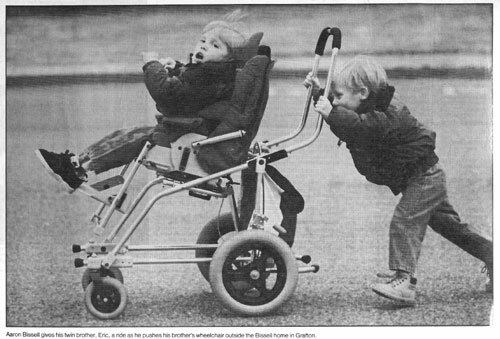 Aaron Bissell gives his twin brother, Eric, a ride as he pushes his brother’s wheelchair outside the Bissell home in Grafton. Special needs teacher Susan McCullen works on motor skills with the twins. 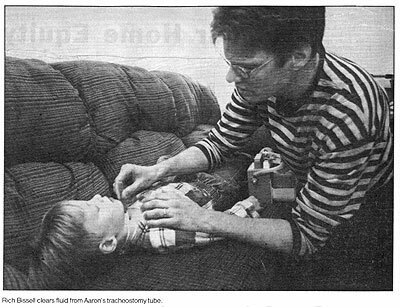 Rich Bissell clears fluid from Aaron’s tracheostomy tube. It’s dinner time for the twins. Eric gets a ride aboard “Duchess” during a therapeutic horseback riding program at Holden’s White Oak Farm. For Aaron and Eric Bissell, born at 26 weeks, life came with problems. For their parents, Rich and Cindy Bissell of Grafton, Their lifestyle changed abruptly. But the struggles of the twins, now 3 years old, and their parents’ is truly inspirational. Telegram & Gazette photographer Steve Lanava spent some time with the Bissells and portrays some of the activities in a day of their lives. Just a decade ago, Eric and Aaron Bissell might not have survived their early arrival in the world. Today, premature and low birthweight babies stand an excellent chance of not only surviving but growing up with few or no serious medical problems. But when there are problems, their families can find resources to help them clear the medical, emotional and bureaucratic hurdles that often arise. The improved odds for today’s preemies are the result of remarkable advances in technology and a lot of old-fashioned tender loving care. The key to survival, in many cases, is improved medical technology. Artificial surfactants are used to replace the protective fluid that normally coats and protects the developing lungs of newborns but is deficient in premature infants. Respirators equipped with transducers sense and automatically adjust to a baby’s breathing patterns. Steroids reduce the severity of hemorrhages in the brain. At the same time, family-friendly hospitals give fragile young lives the benefit of a mother’s touch and a father’s voice. Around-the-clock nursing care ensures that babies are carefully monitored. Twins are often placed together, a practice that promotes weight gain. In the dim light and hushed rooms of the neonatal intensive care unit, families give the medicine of love to their children. Love notes from siblings and parents cover plastic incubators and warm the cold, sterile touch of tubes. Stuffed animals, most bigger than the preemies themselves, keep watch alongside beeping heart monitors. Here, families find the privacy they need to deal with the losses that come with premature birth — the unmet expectations, strains on relationships, and, sometimes, death. Founded 22 years ago, the unit was expanded in June to a deluxe, 43-bed facility. It is the only Level 3 neonatal unit in Central Massachusetts a designation based on the availability of nursing care, surgical staff and equipment. There are isolation rooms to protect the most fragile infants from infections, and a continuing care nursery for those almost ready to go home. Fortunately, most premature infants do go home. And most have few, if any, long-term medical needs. For the families they go home to, however, the financial and emotional struggle of dealing with such fragile young lives has often only just begun. Chances of Survival – Shown are survival rates for premature infants who receive neonatal care in the 1990’s. Normal human gestation is 36 to 40 weeks. Source: University of Wisconsin and The Center for Perinatal Care at Meriter Hospital, Madison, Wisconsin. The process begins in the hospital. Heffernan helps families apply for Social Security benefits. She dispenses information on transportation, housing, employment, insurance and how to use the federal Family Leave Act. She refers parents to the regional office of the Department of Public Health, which is the lead agency for providing services and referrals to children from birth through age 3. Each family, de la Torre said, brings its owns hopes and fears to the process. Some are proactive, seeking out every source of assistance available. Others are in denial, fearing a problem exists but not wanting to confront it. Many recognize there is something wrong with their child, but fail to appreciate how that will affect their finances and lifestyle. In a growing number of cases, especially with families from Eastern Europe and Latin America, there are cultural barriers. For them, government intervention is a thing always to be feared. DPH caseworkers must walk a fine line — educating families in need without frightening them. They rely upon pediatricians and hospitals for many referrals, but other children are picked up much later, when day care workers or teachers notice developmental delays. Healthy Start promotes early, comprehensive and continuous prenatal care for low-income, uninsured women. Public benefits specialists help families obtain Social Security and Medicaid benefits as well as other health care coverage and assistance, including paying for hearing evaluations, hearing aids, and other costs not covered by insurance. Early intervention program develops and implements strategies to support families with young children at risk for developmental delays. An estimated 14,000 children in Massachusetts are eligible for assistance each year under DPH definitions. Family Ties is a parent-to-parent information and support network for families of children with special needs. MASSTART (Massachusetts Technology Assistance Resource Team) assures the health and safety of technology-assisted children in schools by expanding skills, knowledge and training of teachers and nurses working with those children. Massachusetts Genetics Program facilitates genetic screening, counseling, diagnostic and support services and offers information about the causes and prevention of genetic diseases and congenital anomalies.